Divorce yourself from the far out scifi depictions and crazy nerd dreams of what a smartwatch is supposed to be for just a second, and instead think about what makes sense for a wrist-mounted device in 2018. You’ll quickly realize there’s a huge gap between reality and expectation, because while the idea of playing games or watching videos on a watch might sound neat, actually doing so on a screen that’s measures less than two inches across is simply miserable. That’s where Samsung’s new Galaxy Watch comes in. 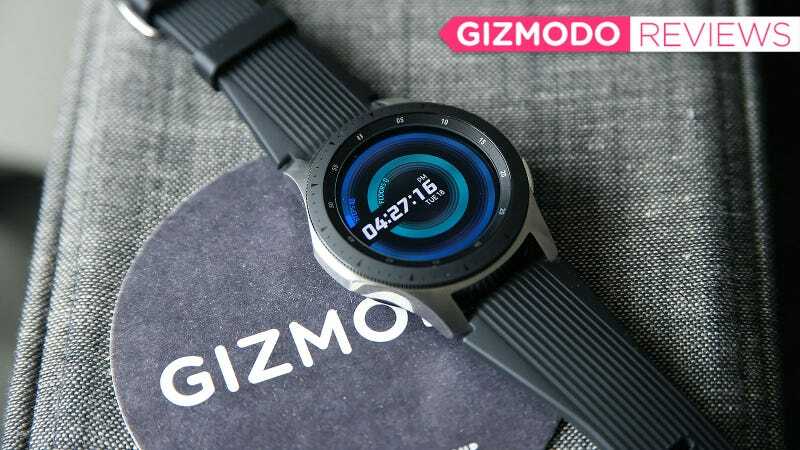 On top of being able to do standard smartwatch stuff like relay notifications, count steps, and reply to texts, the Galaxy Watch looks to expand on the true purpose of modern smartwatch: tracking your health and fitness. For this year’s watch, the number of activities Samsung’s software can automatically track has doubled from three to six, while the total number of excersizes that can be monitored has increased even more to a total of 39 different workouts, including specific things like planks and lunges, or a combination of multiple things at once for people who want stats on an entire high-intensity interval training session. Samsung has also improved the Galaxy Watch’s sleep tracking and added a new stress tracker to the mix, though some of that is more useful than the rest. Once a task reserved for Fitness trackers, keeping tabs on your wellness is now basically a requirement for all wearables. Some devices may offer fewer features in return for a lower price, while others may provide specialized tools for marathoners, triathletes, and more. But that still leaves smartwatches as general purpose devices that can be both a helpful companion to a smartphone, or a standalone gadget for tracking workouts. For anyone who’s paid attention to the evolution of Samsung’s smartwatches over the last years, the Galaxy Watch will appear immediately familiar, which in this case is good thing. Looks are always subjective, but I think the Galaxy Watch is the best designed digital timepiece on the market. It features a housing constructed of sturdy aluminum on top and plastic on the bottom, and pulls back from the Gear S3's overly aggressive design to create something a little more sleek and svelte. I will admit the larger 46mm review unit I’ve been wearing over the last few weeks isn’t small by any means, but there is a smaller 42mm versions for anyone with concerns. More importantly though, Samsung hasn’t messed with the Galaxy Watch’s control scheme. There are two buttons on the right side for Home and Back, which is just enough to quickly jump between screens without getting too complicated. And then there’s that rotating bezel, which can be spun in either direction to navigate between notifications, widgets, and apps. It really is one of the best examples of form and function working together in harmony, blending a feature that’s been on watches for hundreds of years and repurposing it in a way the makes perfect sense in today’s more techy landscape. Twisting the bezel left lets you scroll through notifications as slowly or as quickly as you like, and as soon as you run out of things to read, you can simply press the trash icon to clear them all away. Going right gives you access to all your important apps and widgets, so that music controls, your calorie count, and more are never far away. And with a rated-water resistance of up to that goes down to 5ATM (over 150 feet) and models with optional 3G/LTE connectivity, you can do all these things in a pool, or without the help of a nearby smartphone if you so choose. The Galaxy Watch even comes with 4GB of onboard storage so you can stream music from the watch to a pair Bluetooth headphones, so you can listen to music without needing to carry your phone or pay for the the more expensive mode with LTE. In practice, the automatic activity tracking works quite well if your main forms of exercising are running or biking. I did run into one situation where for some reason, the Watch did not recognize when I jogged a mile on a treadmill, but that only happened once in the course of multiple weeks. Things like detecting a lat pull down was also quite precise, though getting the watch to properly start tracking your movement sometimes feels clunky because you often have to wait a few seconds to detect when your hands are in position, potentially messing with the rhythm of your workout. The dream is that one day, a smartwatch will be able to automatically track any exercise you do, and while the Galaxy Watch hasn’t quite nailed it yet, the path forward is there. You can see date for stress, sleep and activity on the watch, or in Samsung’s recently revamped S Health app. As for the watch’s sleep tracking, Samsung now gives a better breakdown of how much time you spent snoozing, what percentage of that was actual healthy sleep, and even the shows you all the times you transitioned between various sleep states. In my case, it was rather humbling because while I often try to get eight hours, my sleep efficiency is really only in the high 80's, which means I’m actually getting closer to six and a half or seven, which probably goes a long way to explaining the constant bags under my eyes. And while it sounds somewhat obvious, a lot of the sleep tracking functionality comes from Samsung’s ability to make the chips inside its watch, unlike the vast majority of Wear OS devices, which rely on Qualcomm to provide more updated guts. In the Galaxy Watch, Samsung claims its Exynos 9110 processor is 35 percent more efficient that Exynos 7270 in last year’s Gear Sport, and when it comes to battery life, it definitely shows. I have routinely gotten five days of battery life, only falling short during my first four day span where I was excessively testing out as many features as possible. This kind of longevity is important because it gives you the confidence to leave the Galaxy Watch’s wireless charger at home during a long weekend trip. But it also serves as a stark contrast to devices like the Apple Watch, which has always struggled to last more than 18 hours or so. That means while you can get interesting new features like an entry-level ECG on the new Series 4, you won’t get stuff like sleep tracking because an Apple Watch needs to be charged every night. On the flipside, the Galaxy Watch’s stress tracking doesn’t quite live up to expectations. That’s not to say it doesn’t work, because it’s quite easy to scroll over to the widget and have quickly measure how you’re feeling, but it doesn’t alert you automatically like you want it to. When I think about the benefits of stress tracking, I imagine a device that will ping me just before I hit peak frustration, and then walk me through the watch’s simple breath exercise to prevent any additional strain. That said, Samsung says they are looking into improving stress tracking, and may able to add something similar in the future. The other major disappointment is Bixby Voice on the Galaxy Watch, which is really just a rebranded version of S Voice. It’s basically there to use your speech to send texts or turn on stuff like activity tracking. But requests like asking about traffic on your commute or the score of a football game—things easily handled by Siri, the Google Assistant, and even the phone-based version of Bixby—tends to result in some sort of error message. 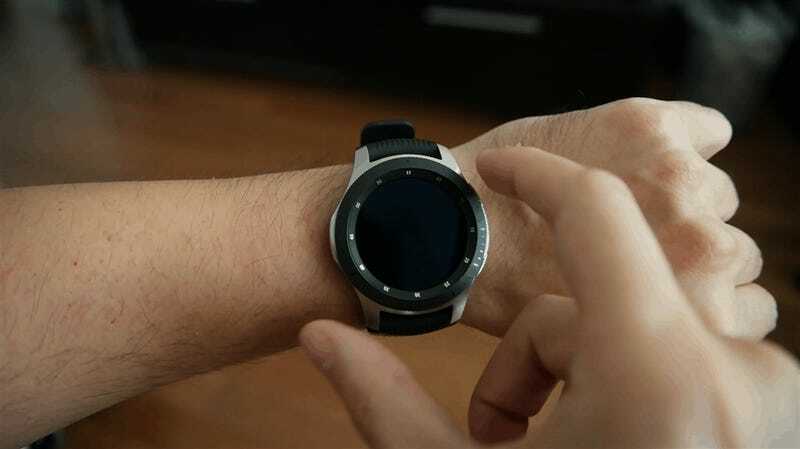 And while a large library of useful apps has really yet to appear on any smartwatch platform, the Galaxy Watch’s Tizen app ecosystem remains quite thin. A lot of big names are available, including Spotify, which is now the streaming music platform of choice for Samsung devices, Strava, and MyFitnessPal, though others like the Philips Hue Tizen app that was supposed to have been released last year has still yet to appear. I also want to quickly mention that Samsung needs to do a better job of curating its app and watch face stores, because trying to find things in the Galaxy Wearable app is often more annoying that it should be. 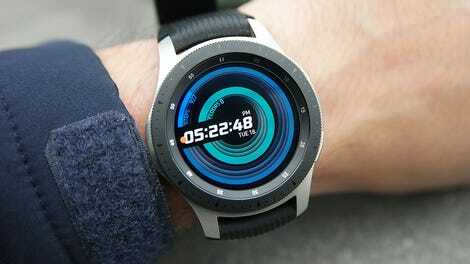 But as a smartwatch that looks to improve your wellness through heart rate monitoring and activity tracking while also doubling as a proficient smartphone companion or even a standalone workout tool over LTE, the Galaxy Watch is right up near the top of what a modern smartwatch can do. It’s got a superb design, it’s interface is the best of any watch on the market, and while it’s starting price of $330 ain’t cheap, it is less expensive than a new Apple Watch. And even though there’s still a fair bit of refining left to do before Samsung truly realizes modern wearable dream, as is, the Galaxy Watch is still pretty slick. Battery life on the standard 46mm version is right around five days, with the smaller model offering about four. If you add LTE-connectivity on top of that, expect battery life to drop by another day or so. The Galaxy Watch’s design is simple yet stylish, and its rotating bezel remains the best way to navigate a smartwatch UI. The number of workout that can be tracked has jumped up to 39, with six of them capable of being tracked automatically. Unfortunately, getting the tracking to work can sometimes be a bit clunky. Stress tracking doesn’t quite work you like expect, though Samsung says it is working to improve that in the future. Compatible with both Android and iOS phones, though people with Apple phones will suffer from a slightly more limited feature set. The Galaxy Watch has Samsung Pay built it, but it only works on terminals with NFC, but unlike the Gear S3, it’s missing MST support. Is the New Apple Watch&apos;s ECG Feature Legit?